If you've read this blog in the past, you know that I like station wagons, I like Saabs and I like "sleepers". The Aero was the performance version of the 9-5. It came with a 2.3 liter I4 turbo, which moved it to 60 MPH in 6.5 seconds. That's an impressive number. 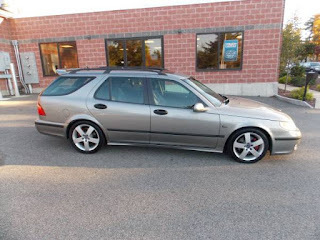 (An Audi 2.8 Avant takes 8.8 seconds, a BMW 525iT, 8.0 seconds and a Volvo V70 T5 6.6 seconds.) The suspension was "sport tuned" and the Aero got some extra aerodynamic body molding. The 9-5 Aero came with just about every creature comfort available from Saab. It had an interior that was laid out almost perfectly in Saab's typically unique way. All 9-5s came with GMs OnStar system. 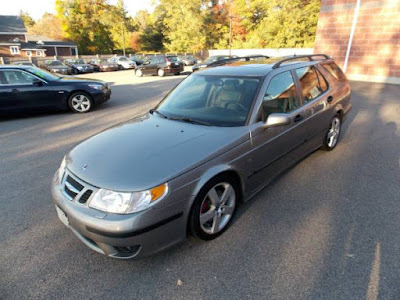 Saab was known for making safe, reliable cars. The first part was always true. European crash tests put Saabs near the top in safety. As for reliability, Saab slipped around the turn of the century. 1999-2003 Saab 2.3t engines have a high rate of failure due to oil sludge problems. (Similar to the problems VW / Audi had with their 1.8 turbo engine.) Saab corrected the problem in 2004 and created a retrofit repair for earlier engines. When buying an older, pre 2004 Saab, it's important to know whether this repair was done. Using synthetic oil is a must. Used Saabs don't sell for a lot of money. The above mentioned problems and the failure of the brand have driven prices down. I have owned 3 Saabs, a 9000 in the 1990s, and two that I still have; an NG900 convertible and a 2002 9-5 (Linear). I do the usual maintenance, and they have been very reliable. This car, when new, sold for over $40,000.00. It's being offered today for about 1/10th of that price. It appears to be in very nice condition. Being a 2004, oil sludge will not be a problem. Located in Canton, MA, click here to see the Craigslist listing. Wow!!! This saab model is really good choice for those like "sleepers". 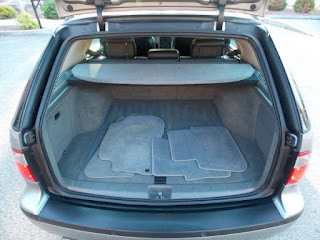 The front seat looks so comfortable and there is a big space at the rear end for luggage. All brands are having some features that distinguish them from others. Thanks for describing this model as well as comparing it with other models.